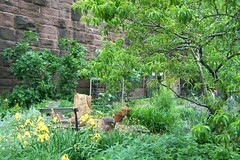 A well tended and established community garden on Brunswick St, between 5th and 6th, bordering on the 6th Street Embankment. A budding butterfly garden was planted summer 2011 and will be registered as a wildlife habitat with the National Wildlife Federation. This is called the "Brunswick Community Garden"